This paper searches for an entry point and a platform to learn across boundaries to achieve synthesis, so that Traditional Chinese Medicine and system engineering could also understand each other and benefit from each other. The search involves investigation of both western and eastern point of view including systems theories, set theory, Confucianism, and Daoism. 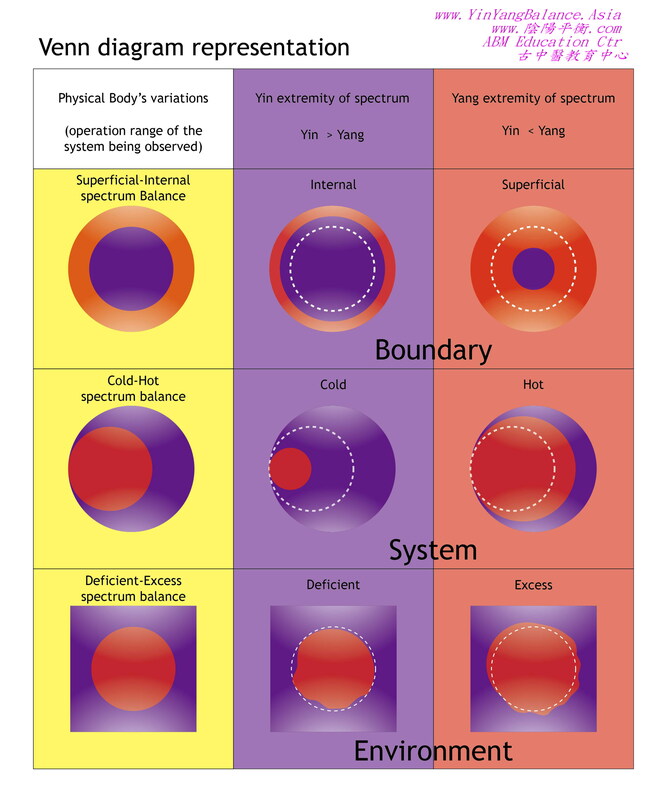 A promising Yin-Yang Five Elements i ± 1 System is established through this research. Traditional Chinese Medicine (TCM) has been servicing and maintaining the health of human bodies for thousands of years. Due to the isolation and control policies of the last two dynasties Ming and Qing, scientific inventions are not being applied to TCM. On the other hand, Western Medicine (WM) has been technologically advanced by the engineering of the industrial revolution age. Nowadays, many researchers and engineers have tried to advance TCM with modern technologies, for example, medical expert diagnosis system, office automation, herbal ingredient spectrum analysis, modern medical diagnosis machines. 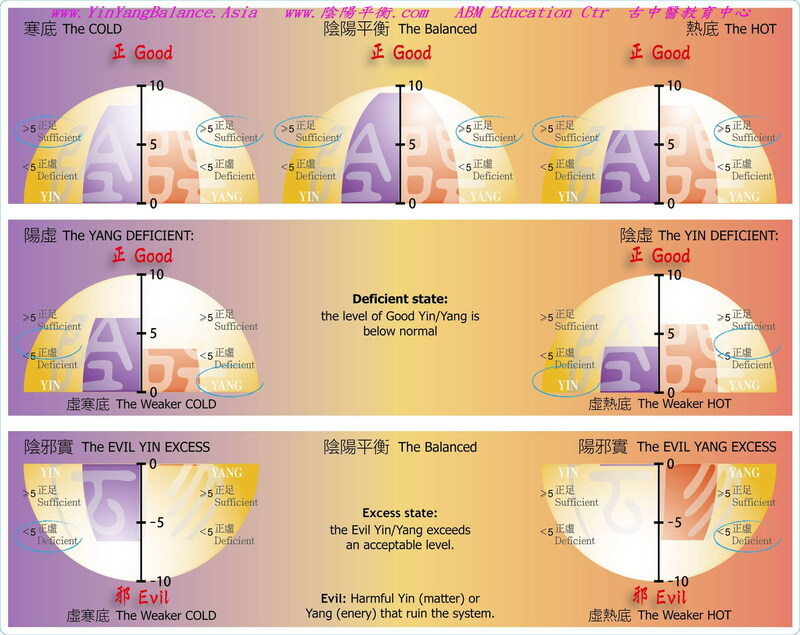 However, the merging has not resulted in much advancement in TCM as in WM. The reason, as believed, is that TCM is a holistic diagnosis-cure process while industrial revolution age engineering is reductionism. It is believed that real advancement could be achieved by the synthesis of TCM with system engineering. Not only that TCM could be advanced, system engineering could also benefit from the experience of thousands of years of holistic servicing and maintaining the human body complex system. This paper searches for the entry point and the platform to learn across boundaries for the synthesis, so that TCM and system engineering could also understand each other and benefit from each other. 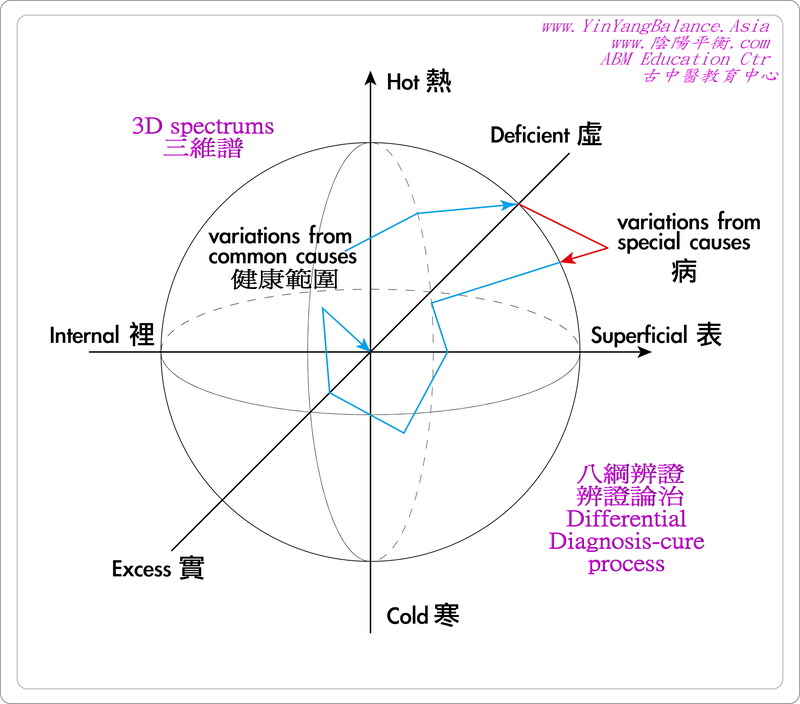 TCM is being practiced daily based on the theory of differential diagnosis-cure process. It involves firstly, the awareness, that is, the systemic observation of the human body for information collection. Secondly, the perspectives, which involve the systemic choice of related rules and relationships. Thirdly is the systemic choice of importance, that is, the formulation of weighting of each piece of information and perspectives. 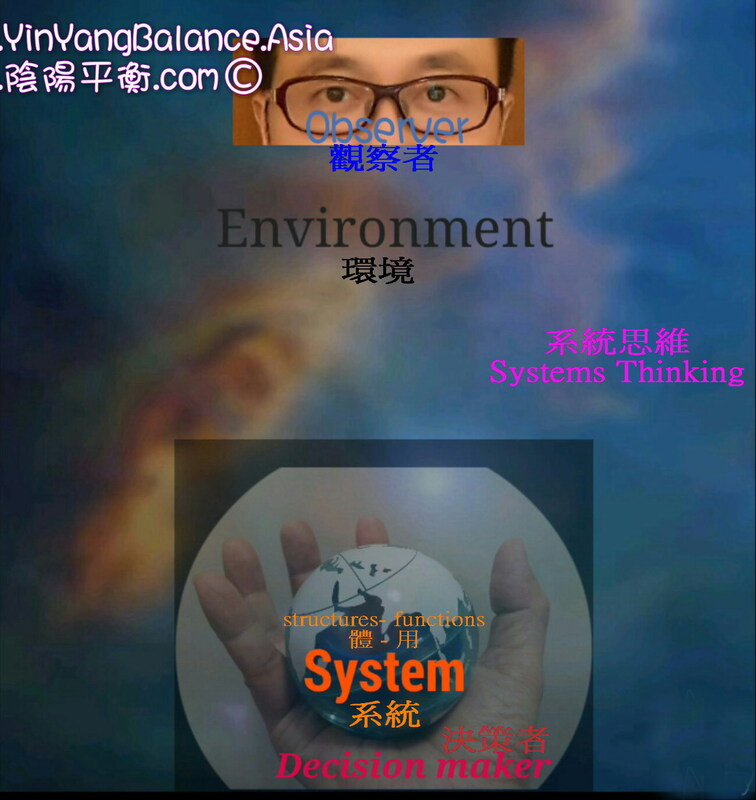 Finally is the systemic choice of strategies, for regulation of the self-healing system of the human body to regain the balance. The cycle of these four aggregates would continue to adapt to changes in the environment and the human body system until the healthy objective is achieved. The current state of the human body is represented by three fundamental spectrums, namely, the Superficial-Internal spectrum, the Cold-Hot spectrum and the Deficiency-Excess spectrum, which are believed to have the same origin as set theory. The body can then be divided into five sub-systems namely, liver-wood, heart-fire, spleen-earth, lung-metal, and kidney-water, each system has its own sub-state represented by the same kind of three spectrums. It is believed that the same diagnosis-cure principals could be applied to either natural or man-made systems. To develop a systemic expert diagnosis system in the perspective of system engineering would help TCM to practically make use of modern information revolution age engineering technology. It would also provide a platform for understanding the holistic view and application of TCM to the natural complex human body system. Future work would involve the search for possible system engineering projects to be constructed for the other two important theories of TCM. The theory of holism in TCM is embedded everywhere but usually referred to in the theory of “correspondence between nature and human”, or “human living with the environment”. The coherence is divided into three parts namely, the sky, the earth, and the human, which could correspond to time, space and observer (and decision maker). Different time of the year, location and people in the environment would provide favorable and unfavorable conditions for different actions. 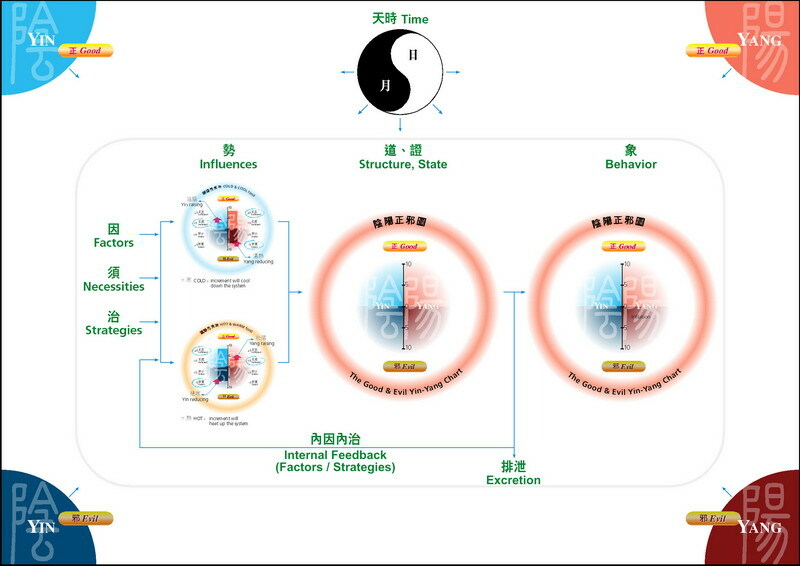 The third theory for possible entry point is the differentiation and integration properties of the Taichi Yin-Yang system theory and the five elements system theory. This property shows that no matter how many times we differentiate a system into sub-systems, the Taichi Yin-Yang and five elements properties apply. On the other hand, no matter how many times we integrate sub-systems into a single system, the Taichi Yin-Yang and five elements properties also apply. This would facilitate the design, implementation and maintenance of the whole macroscopic-microscopic spectrum of systems. With all three theories, one fundamental process applies to them all. That is, the continuous balancing of the spectrums in order to achieve the objectives. This same process exists in Confucianism as the “Doctrine of the Mean”, and also in the teaching of Buddha as “The Middle Path”. The whole is greater than the sum of its parts was pointed out by Aristotle. Systems thinking involves more than just analyzing the object making up from different parts, but rather involves the parts and their relationships, the structure and functions of the object, its environment, the boundary, and the observer(s) and decision maker(s) as well (Dekkers 2014) as shown in Figure 1. Human senses works by differentiation (distinction) (Wong 2008) (Klein & Wong 2012). 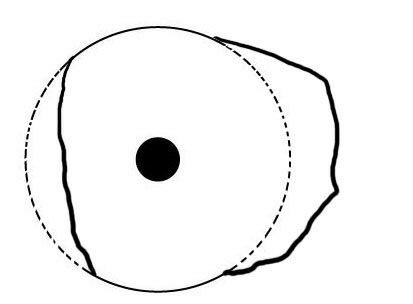 All senses differentiate the object (signal) from the environment through the boundary. In engineering terms the ability of the sensor to detect depends on the signal to noise ratio (SNR) (Wikipedia a). 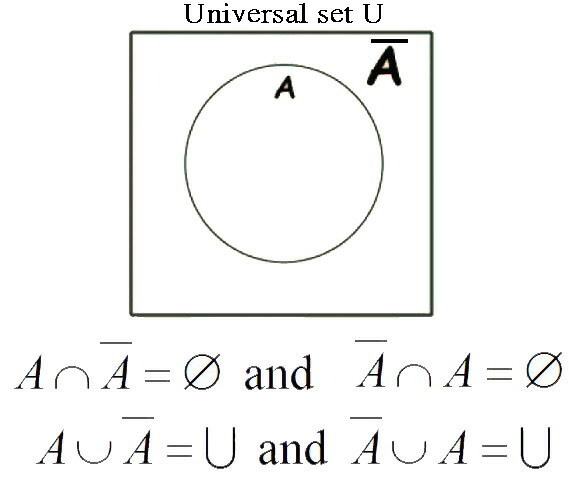 An analogy is the basic axions in set theory in mathematics (Al Lehnen 2007) as shown in Figure 2. As a result, the differentiation process produce three components namely A, not A and the boundary. It also produce two relationships namely union and interaction. 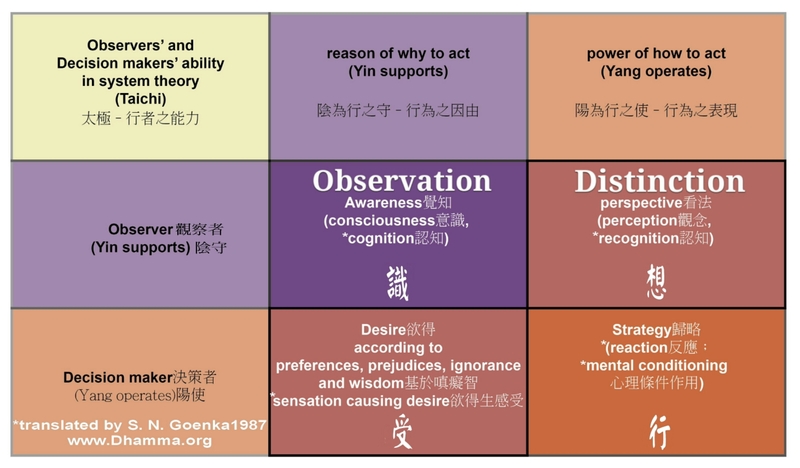 Since the differentiation inherited in the six human senses, namely sight, hearing, touch, smell, taste and thought (Wong 2008), is universal to human, it could be used as a common platform for communications. 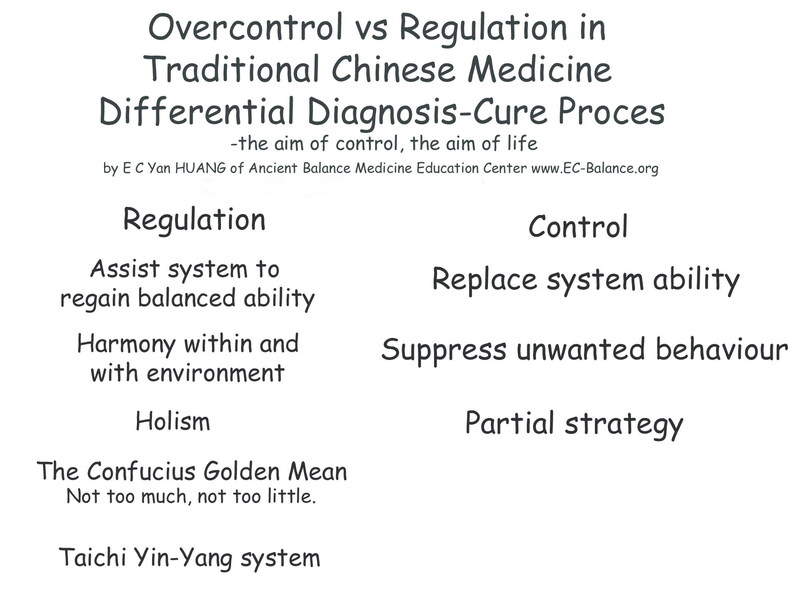 Traditional Chinese Medicine employs different differential diagnosis-cure processes to determine the state of the human body and prescribe corresponding strategies for a cure (Kaptchuk 2000)(Wong 2010c). 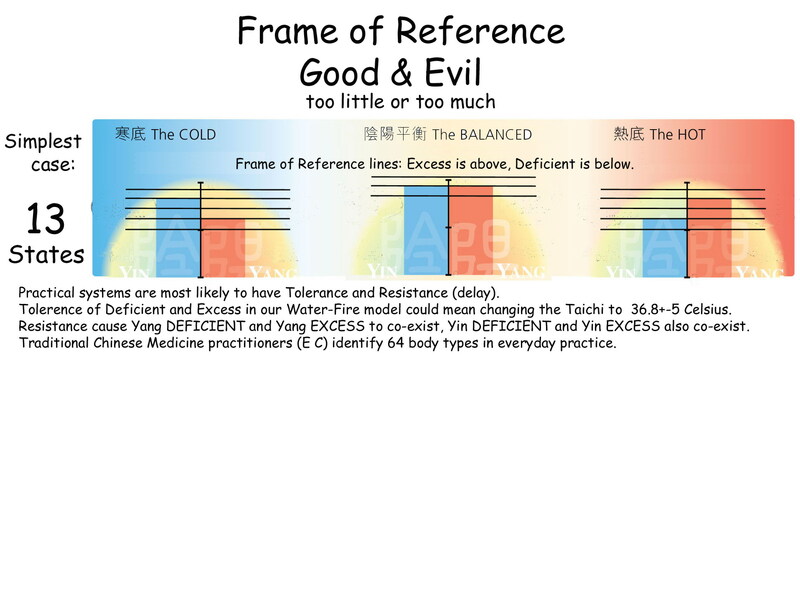 And research shown that there exists a basic pattern (Wong 2007a)(Wong 2010c) for all the different processes, namely superficial-internal spectrum, cold-hot spectrum, and deficient-excess spectrum, which are first mentioned in (HuangDi 206BC- 25AD) (Gou 1999). The static and dynamics of the spectrums are shown in Figure 3 and Figure 4 respectively. TCM is the maintenance engineering rather than design engineering of the human body. 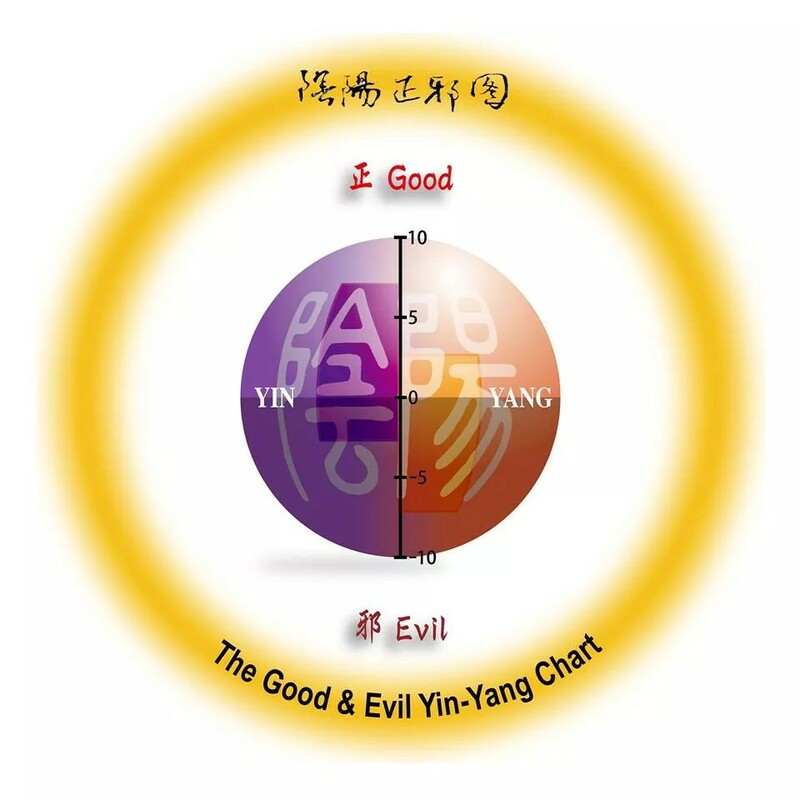 Research show that the body state of human body can be represented graphically as the simple Good n Evil Yin-Yang chart as in Figure 5a or the complete Good n Evil Yin-Yang chart with the Superficial-Internal spectrum as in Figure 5b (Wong 2005a). Our research found that a 3D representation provides a more vivid understanding and could correlate with the representation of the dynamics in Cybernetics, as shown in Figure 6. However it should be noted that this 3D spectrum is not another representation of the 3D space. It is believed that future research would shown that the spectrums could be used to represent the whole space-time and systems together in one. which have division on the LHS and multiplication on the RHS. The division could be thought of as compression and the multiplication could be thought of as expansion geometrically on the number spectrum (Sanderson 2015). This compression of energy into matters is found in the CERN Large Hadron Collider (LHC) for making new matters, and the expansion of matter into energy is found in all nuclear plant. That is, the exchanges between Yin and Yang require two different processes. As a result, the static three elements in the Taichi Yin-Yang combo requires two more processes to become dynamic. 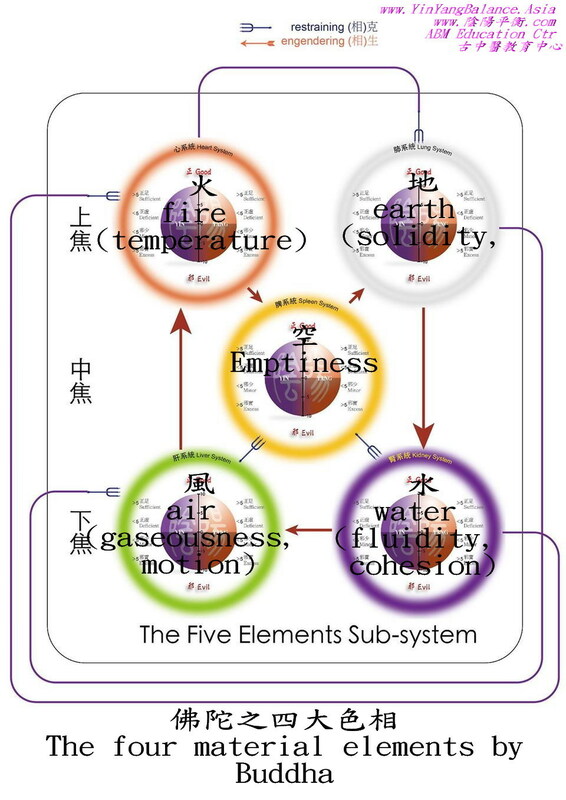 Five elements exists in oriental systems thinking in TCM, Confucianism and Doaism (Wong 2008). Our research shown that the five element systems could be represented as in Figure 7 with the engendering (birth) cycle and the restraining (control) cycle (Wong 2005a). Therefore, we started with the differentiation nature of human senses, which produce the three elements Taichi Yin-Yang combo, which then produce the five elements system. That is, the choice of three and five is not particular observer dependent, but rather universal to all observers. The preliminary matching of the Five Elements System and other system theories are shown in Figure 8. The five aggregates human system was employed by Buddha (Buddha 2500 BC) to represent the properties of human body and mind. The idea was explained in details in Vipassana mental healthcare 10 days courses held all over the world (Goenka1987a). Research shown the possible relationship between the five aggregates and the fundamental systems theory (Wong 2008) as shown in Figure 9. The fifth aggregate is the physical body which is composed of the four material elements of earth, water, fire and air (Goenka1987a). Together with the idea of emptiness mentioned in (Buddha 2500 BC), it is possible to match the five elements system in TCM, Confucianism and Doaism with the four material elements of Buddha. Future research would be to investigate if Figure 10 would be a possible practical match. The idea of “unification of nature and human” was pointed out in Confucianism and Daoism, and was one of the most important concept in TCM (Kaptchuk 2000, 天人合一). Confucianism pointed out that in I Ching Hexagram that the top two lines represent Heaven (天), middle to lines represent Human (人), and the bottom two lines represent Earth (地) as shown in Figure 11 (Confucius 479 BC, part II 兼三才而兩之). Water is the most important elements in the teaching of Daoism (Laozi 590 BC, Ch 8, 76, 78). 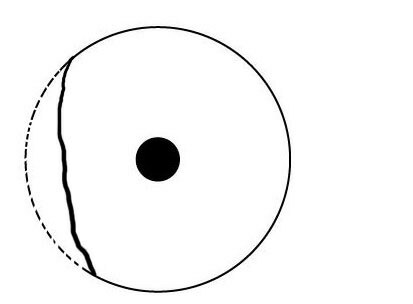 Water has almost the same properties of Dao (Tao), with the difference being water has form while Dao has none. 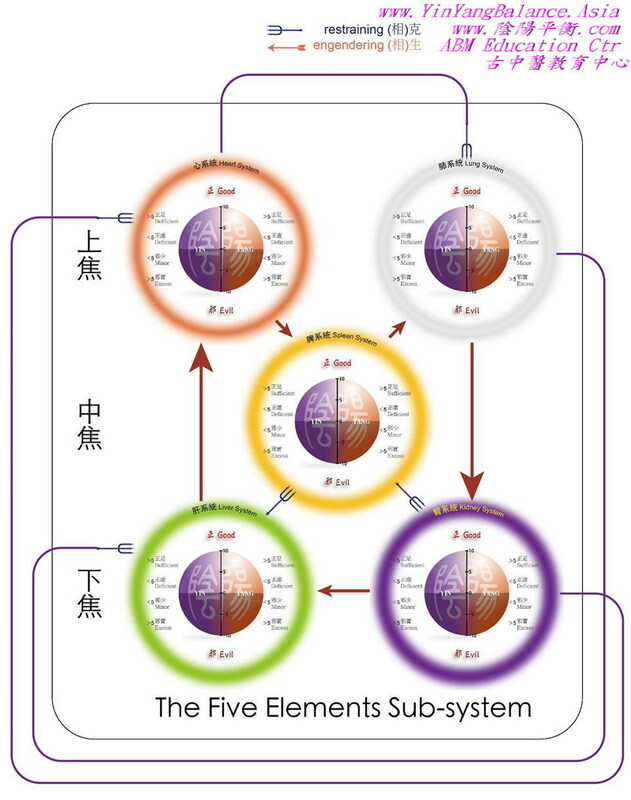 Maybe the water system in the five elements system theory could be expanded into five elements as well. 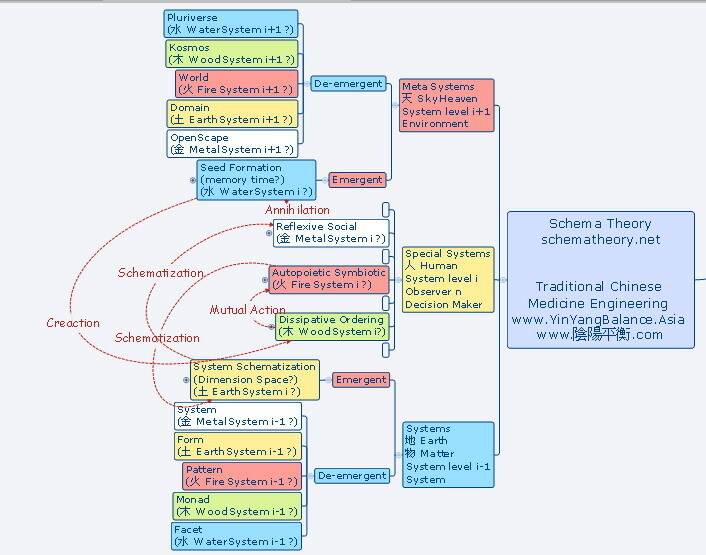 Schema theory is developed by Dr. Kent Palmer (Palmer 2004) for constructing a foundation for systems engineering. Figure 12 shows the possible matching of the three levels of five elements systems with the 13 levels in Schema theory, namely Pluriverse, Kosmos, World, Domain, Open Scape, Reflexive Social, Autopoietic Symbiotic, Dissipative ordering, System, Form, Pattern, Monad, Facet. Note that it match with a five elements system structure with the Earth and Water systems expanded into two other five elements systems of different levels, resulting in 13 levels! It has been the believe that the environment is outside the five systems at level i, however, our research shows that the five elements system could be more compact, simple and fractal. It should be noted that the 13 levels structure of the level i+-1 system could be applied to any system at level i. From the above analysis, the whole structure seem to be the direct result of the observation nature of the human observers, rather than an arbitrary invention. We named this discovery as the Yin-Yang Five Elements i ± 1 System as shown in Figure 13. TCM inherited as a daily practice, the essence of oriental ancient systems thinking. It does not only contain the basic structure of systems but also the maintenance process of the human systems. Therefore, the theory is useful for both design engineering and maintenance engineering. TCM was thought of as the macroscopic level medicine while the western medicine was thought of as the microscopic one. Therefore resulting in strong conflicts between them. However, with the help of systems engineering, it reveals that both the human level i system and the cell level i-x system would have the same systemic structure and functions. 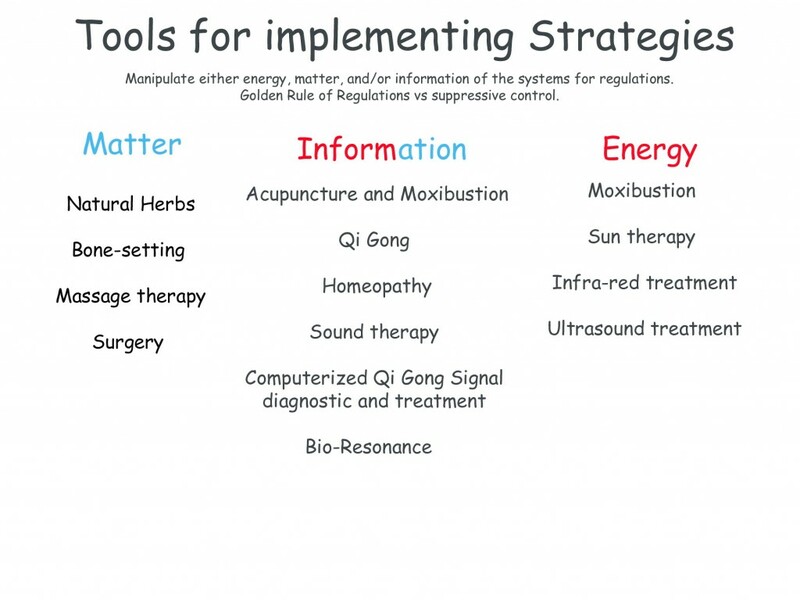 This common platform would provide effective communications between TCM and WM for investigating the best medicine for regulating human bodies. In this paper we start from the investigation of the properties of human senses but similarities are found in different fields of sciences including mathematics, physics, engineering, systems thinking and Traditional Chinese Medicine. Previous research combined the observer and systems into one Five Elements System and the environment as the element outside the Five Elements System. However in this paper, the Five Elements Level i+-1 system is established, which includes all the fundamental components of systems thinking in just one Five Elements Systems, with nothing else outside. The Water sub-system is the environment. This important discovery is very promising and would largely advance the Taichi Yin-Yang Systems theory and the Five Elements System theory. 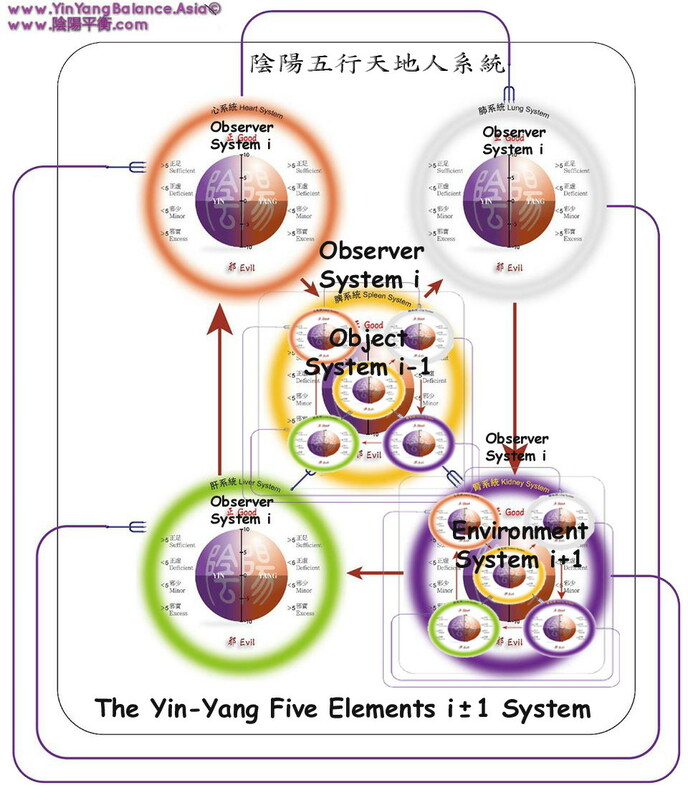 It is believed that the Yin-Yang Five Elements i ± 1 System structure and system function could be used as a systems design tool or a system maintenance tool, for systems with any size and complexity. Moreover, the Yin-Yang Five Elements i ± 1 System model could be used as a platform for communications between analysis of different levels of i+-x. For example, it could be a communication platform for the modern medical cellular analysis at level i-x, the TCM human healthcare analysis at level i, and even the social analysis at level i+x. Future works could involve the mathematical constant ratio and transformation functional relationships between the five systems and the systems at different levels. Al Lehnen. 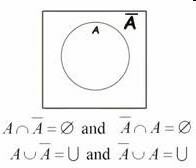 (2007) An Elementary Introduction to Logic and Set Theory. Accessed at http://faculty.matcmadison.edu/alehnen/weblogic/logset.htm#Unions on May 1, 2007. Confucius (479 BC). Confusions Ten Wings shiyi 十翼. China《系辭上傳》曰：「一陰一陽謂之道」. Accessible at http://www.fushantang.com/4000/02/p2047.html, on May 1, 2007. FuXi Shi 伏羲氏. (1122 BC). I Ching. China. Accessible at http://afpc.asso.fr/wengu/wg/wengu.php?l=Yijing&no=0, on May 1, 2007. Gou, A. (1999). 黄帝內经素问校注语译 Huangdi Neijing Suwen Jiao Zhu Yu Yi (Yellow Emperor’s Inner Classic: Plain Questions ?Critically Compared, Annotated and Translated) ISBN 7-5308-2114-8.Tianjin Science and Technology Press, Tianjin, China. HuangDi 黃帝 (206BC- 25AD). Huang Di Nei Jing (The Yellow Emperor’s Classic of Internal Medicine). China. Also available at http://www.amazon.co.uk/gp/reader/0520021584/ref=sib_rdr_fc?ie=UTF8&p=S001&j=0#reader-page on May 1, 2007. Laozi, (Lao Tse) 老子(590 BC). Dao De Jing (Tao Te Ching)《道德經》. China. Accessible at http://www.thetao.info/english/english.htm , http://afpc.asso.fr/wengu/wg/wengu.php?l=Daodejing&no=0 on May 1, 2007. Wong, T.S.L and others (2005a). Traditional Chinese Medicine Diet – the food dictionary 中醫食療字典, ISBN 978-988-985-865-0, Copyright Ancient Balance Medicine Education Center Ltd., Hong Kong 版權所有 古中醫教育中心有限公司（香港）. Wong, T.S.L.and others. (2007a). The modern logic of the TCM differential diagnostic process 辨證論治的現代邏輯 [Oral presentation]. 29th AACMA Australasian Acupuncture & Chinese Medicine Annual Conference. Brisbane, Australia 18 – 20 May 2007. 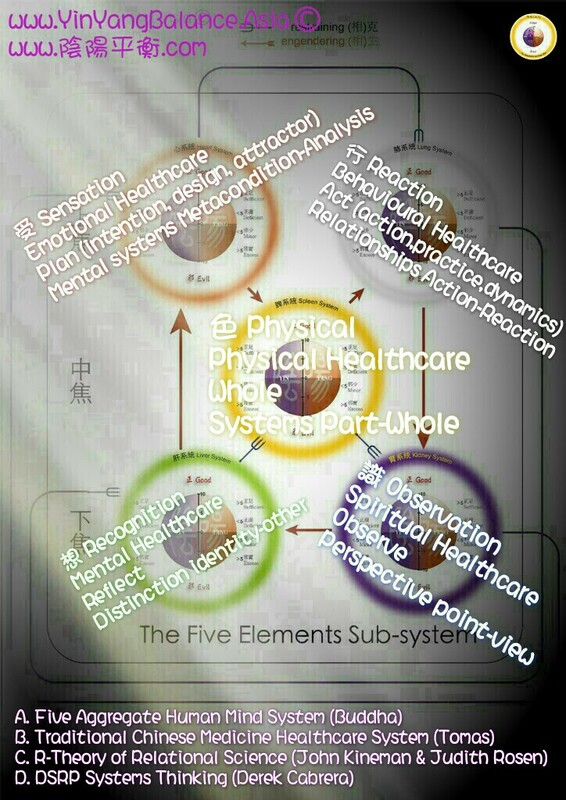 Wong, T S L; Klein, Louis (TBP) Viable System Model and the Traditional Chinese Medicine Five Elements Systems.